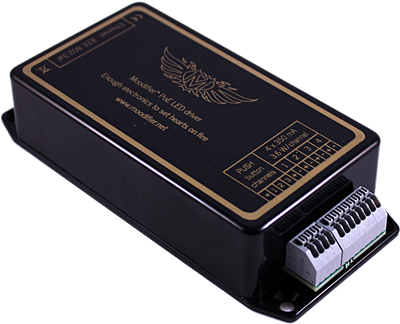 The Moodifier PoE LED driver can power 12W of LED lighting on four individually controllable 350mA LED channels. The four LED channels provide great flexibility and also enables powerful and precise RGBW color mixing. No external power supply is needed since the Moodifier PoE LED driver is powered directly from the network cable. This makes the Moodifier PoE LED driver especially useful in situations where traditional electrical wiring is difficult, costly or unwanted. It also makes the installation very simple, just connect the LED lights and the network cable and you are good to go. 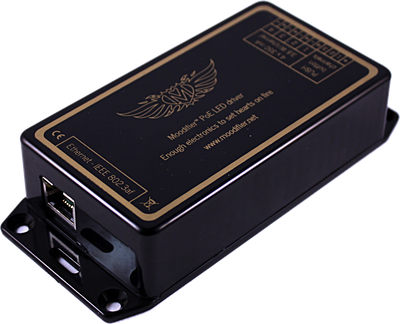 Moodifier PoE LED driver controls your lighting blistering fast and with perfect accuracy. Dimming is done throug pulse width modulation with adjustable frequency between 240Hz and 2.4 kHz which gives a flicker-free and perfect light output with smooth dimming regardless if light intensity is 1% or 100%. The brightness of each LED channel can be changed at a rate of 100 times per second that enables amazing light shows and effects. Plugging in the Moodifier PoE LED driver is simple. Just connect the LED lights to the LED channels on the Moodifier PoE LED driver, then connect the PoE enabled network cable. The lights can then be controlled directly over the network via computers and mobile phones. All Moodifier applications will also automatically find any PoE LED drivers on the local network so that you can start setting up light sense and automation. You can connect three standard wall switch buttons or other sensors to each Moodifier PoE LED driver, each button or sensor can then activate and dim custom light scenes on the unit. 4 connectors for connecting up to 3 push buttons.